Following the 1st International Workshop on Waves, Storm Surges and Coastal Hazards, which incorporated the 15th session of the long-standing the International Workshop on Wave Hindcasting and Forecasting, in September 2017 in Liverpool, United Kingdom, a topical collection has appeared in recent issues of Ocean Dynamics. Here, we give a brief overview of the 15 papers published in this topical collection as well as an overview of the widening scope of the conference in recent years. The continuing trend towards closer integration between the wave and ocean modeling communities is reflected in this workshop, culminating in the renaming of the workshop, while maintaining the connection with the three-decade long history of the wave workshop. This is also seen in this topical collection, with several papers exploring wave-generated storm surge, wave-tide contributions to coastal flooding, forcing a global ocean model with fluxes from a wave model and interaction between surface waves and sea ice. The long history of the International Workshop on Wave Hindcasting and Forecasting has been previously described by Breivik et al. (2015, 2017) for the topical collections following the 13th and 14th International Workshops on Wave Hindcasting and Forecasting. At the 14th Workshop, held in Key West, Florida, in November 2015, it was decided that the next workshop would, for the first time, be held outside North America, hosted by the National Oceanography Centre in Liverpool, UK, 10–15 September 2017. At the same time, in a continuing effort to further broaden the scope of the workshops to foster closer integration between the wave and ocean modeling communities, such as the emerging priority of multi-hazard early warning systems (MHEWS) for coastal inundation resulting from the combined effects of waves, storm surges, tides, etc., e.g., the WMO Coastal Inundation Forecasting Demonstration Project (CIFDP), the workshop was renamed as the 1st International Workshop on Waves, Storm Surges and Coastal Hazards. The workshop continues to explicitly acknowledge the International Wave Workshop, so as not to lose the successful legacy of the previous workshops, including the workshop web site www.waveworkshop.org. In the continued spirit of increasing international engagement in the workshop, and fostering even greater collaboration, the 2nd International Workshop on Waves, Storm Surges and Coastal Hazards, incorporating the 16th International Workshop on Wave Hindcasting and Forecasting, will be held in Melbourne, Australia, hosted by the University of Melbourne, 10–15 November 2019. Fifteen papers relating to the workshop have been published in this topical collection. A brief summary of these papers follows. Wave measurement is a foundational aspect of all wave-related research and applications, including model development and validation, forecasting and verification, satellite wave calibration and validation, and direct use in wave climate and design statistics. This is why wave measurement remains as a theme session in the workshop. In this collection, Wyatt (2019) investigates the ability of high frequency (HF) radars to measure the “first five” Fourier coefficients of the directional wave spectrum. It is found that HF radars are able to measure directional wave parameters, but the quality of the spectra varies strongly with measurement quality, and it varies among the five parameters (first order parameters are more robust) and with the wave frequency (higher frequencies are more robustly measured). Wave forecasting and the related development and validation of wave models of ever increasing sophistication, resolution, and products, e.g., new probabilistic versus deterministic approaches, are a core topic for this workshop. Several authors in this topical collection focused on such developments in wave forecasting. Forecasting of waves under extreme conditions such as tropical cyclones is vitally important for many offshore industries. Zieger et al. 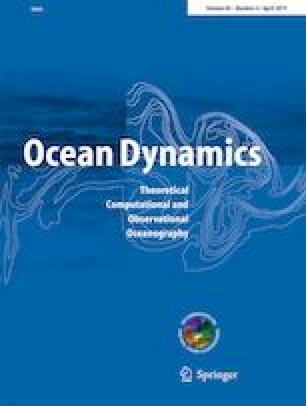 (2018) describe a new ensemble-based wave forecasting system introduced at the Australian Bureau of Meteorology for the northwest Western Australia region, an area subject to on average 11 tropical cyclones per season (Dowdy 2014), with a large number of offshore oil and gas reserves. Previously, wave forecasts have been limited to products from deterministic operational wave models forced by deterministic atmospheric models, with relatively coarse resolution, limiting the accuracy of these products under tropical cyclone conditions. A new dedicated 8-km resolution grid was nested in the global wave model, forced with winds from a 51 member atmospheric ensemble, to take into account the uncertainties in location, intensity, and structure of a tropical cyclone system. The system is designed to operate in real time during the cyclone season providing 10-day forecasts. Verification against observations demonstrates that the new system shows significant improvement over the ECMWF-EPS on each of the metrics examined, although the amount of verification data is relatively small. The improvement in ensemble skill was attributed to the reduction of forecast error for wind-seas. The verification also showed marked improvement in ensemble spread, making it more likely to capture extreme events giving greater confidence to decision-making in complex situations. Caires et al. (2018) describe the development of a state-of-the-art coastal wave forecast system for the East Coast of Korea. In this study, the quality of the input wind was identified as the main factor influencing the quality of the wave results, so the effectiveness of adjusting the wind fields by means of data assimilation using an ensemble Kalman filter data assimilation scheme was explored. The validation of the model hindcasts during the considered storm period shows that the model results are at least as accurate as those of other high-quality local models, and that the model is able to provide predictions of coastal waves meeting available benchmarks. Kita et al. (2018) investigate the wave growth under explosive cyclones (ECs) in the Northwestern Pacific Ocean. ECs are defined as low-pressure systems that deepen below 980 hPa by more than 12 hPa in 12 h. It is found that ocean waves develop very differently under ECs than under tropical cyclones. As ECs evolve very rapidly, the ocean wave field lags behind the peak wind speed by several hours. In a case study of an EC that occurred in January 2013, the wave spectrum indicates that a warm front played a critical role in generating distinct ocean wave systems in the warm and cold zones along the warm front. Both the warm and cold zones have narrow directional and frequency spectra. In contrast, the ocean wave field in the third quadrant (rear left area relative to the propagation direction) of the EC is composed of swell and wind-sea systems propagating in different directions. Nose et al. (2018) consider the sea-state predictability in an ice-free Beaufort Sea in two cases from the fall of 2016 and conclude that, although ice coverage influenced the results through changes of the fetch, the most important factor was the quality of the wind fields. This highlights the difficulty in correctly modeling the atmosphere in an area with rapid ice growth. This is exacerbated by the dearth of observations in the Arctic region. Law Chune and Aouf (2018) report the impact of forcing a global NEMO ocean model with fluxes from the MFWAM wave model. A three-year sensitivity study of three wave-related processes, namely (i) the wave-modulated surface stress, (ii) the Coriolis-Stokes force and the Stokes drift advection of tracers and mass, and (iii) the sea-state dependent mixing (based on the flux of turbulent kinetic energy from breaking waves), reveals a significant reduction of sea surface temperature (SST) bias in the Tropical Atlantic Ocean. This is mainly due to the more realistic momentum flux (surface stress) calculated from the wave model. Wave hindcasts and the development of new hindcasting approaches have long been a hallmark of the workshop. In this instance, Markina et al. (2018) hindcast waves in the North Atlantic using Wave Watch III to investigate sensitivity to spectral nudging. They show how the accuracy of a wind wave hindcast is dependent on a reliable forcing field. An annual cycle is simulated using ERA-Interim reanalysis to force a WRF numerical weather prediction system. The proposed nudging formulation provides a reliable approach for long-term climate studies. It improves the pattern correlation between WRF and ERA-Interim winds. Dynamical downscaling to increase the horizontal resolution also allows the simulation of extreme wind speeds and the associated higher waves. In coastal regions, the differences were up to 20% in mean wind speed and wave height. Accurate representation of coastal conditions is critical for storm impact studies. The presented forcing approach is thus suitable for multi-decadal hindcast reanalysis of basin-scale ocean dynamics. End user applications are also important and reflect the end-to-end scope of the workshop. Knowledge about the statistics of waves, in particular extreme waves, is required for the design and operation of offshore structures, and two papers in this collection address aspects of this issue. Kvingedal et al. (2018) note that, typically, standard models are applied, such as second-order models for the statistics of wave heights and crest heights and regular wave theory for prediction of loads. However, recent research indicates that crest heights may be larger than the standard models specify, due to (1) higher-order effects and (2) area effects. In their study, motivated by the need for more knowledge about these higher-order effects for individual wave heights and crest heights, a long record of field measurements of individual wave heights and crest heights from a location with water depth 190 m in the northern North Sea has been analyzed and compared to well-known theoretical distributions. The main objective of the analysis was to identify and recommend a distribution function for individual wave height and crest height for practical design purposes for such water depths. For wave heights, the Rayleigh distribution was found to form a conservative upper bound, while the Forristall (1978) distribution was considered to show a good accuracy, though somewhat conservative in the most severe sea states. For crest heights, the Rayleigh distribution was found to be non-conservative, while the Forristall (2000) distributions for long- and short-crested sea both provided reasonable descriptions. Based on their study, the Forristall distributions for individual wave height and crest heights in long-crested seas were considered to provide the most appropriate descriptions of these measured wave data. Teich et al. (2018) present the long-term statistics of potentially hazardous sea states in the North Sea based on a wave hindcast of the period 1958–2014. Traditionally, significant wave height and wave period have been used to identify hazardous sea states; however, these give only limited information about the risk posed to ships and marine structures. Teich et al. (2018) investigate a number of indices that go beyond wave height and wave period, for example, rapid changes in sea state, wave spreading, and wave steepness. Since the incorporation of storm surge topics into the workshop scope in 2013, there has been increasing content dealing with storm surge and its interactions with waves and coastal processes. Several papers are published in the present collection which deal with real-time storm surge warning systems, storm surge risk, and modeling of coupled wave-tide-surge interactions. Lin et al. (2018) describe the development and evaluation of a storm surge warning system for Taiwan. They find that the unique topographic nature of Taiwan has an influence on the most appropriate forcing to use for the storm surge model. In particular, they show that for slow-moving typhoons, which tend to interact more significantly with topography than fast-moving typhoons, it is necessary to use realistic numerical weather prediction (NWP) fields (with adjustments to initial wind fields) rather than parametric typhoon wind forcing. Choi et al. (2018) revisit the 1953 North Sea storm surge, but unlike many studies, they focus on the wave-generated hazard. Through numerical experiments using a coupled wave-tide-surge model, they identify wave setup has a 10% contribution to the storm surge peak in the Wash and delta coast areas of the Netherlands. This result is obtained from the application of a barotropic ADCIRC model coupled to the shallow water wave model SWAN, forced by ERA-20C reanalysis atmospheric data. A constant correction factor of 1.2 is applied to reproduce the 10 m winds. The coupling is achieved through model “leap frogging” in time so each model incorporates information from the other. Validation is performed using historic tide gauge and wave records in addition to related literature. Ganske et al. (2018) describe two approaches to identify low probability, but plausible storm surge events. This study provides a detailed comparison of events to demonstrate how the method can inform planning and design of adaptive coastal management strategies in response to changing climate conditions. It is shown that more than the effective wind magnitude is required to project the highest storm surges. The wind duration exceeding a threshold and storm track also play a key role. However, the effective wind is an approach that can be used when there is no water level data available. This approach can be used to identify high storm surges for further impact assessment to better inform coastal management planning and coastal scheme design. Lewis et al. (2019) consider the impact of wave-tide interactions on nearshore wave height within the Irish Sea in the context of coastal flood risk. They found that in some regions, wave heights at high water were 20% higher when coupled processes were included. Exploring the impact of different spatial resolution on their modeling results, they found that wave-tide interaction was sensitive to spatial resolution due to the effect of tidal current changes around bathymetric features. While the workshop has always had a strong program related to wave hindcasting and forecasting (now expanded to storm surge), and the end user applications, it also deals with topics which are further up the research chain, contributing to the end-to-end nature of the meeting, including nonlinear wave theory, freak waves, and solitons. Two papers which deal with these types of research are contained in this topical collection. Fujimoto et al. (2019) investigate the geometry and possible generation mechanisms of freak waves. The authors focus on two deep-water measurements of freak waves observed by a GPS buoy located offshore the Tohoku area, in Japan, during the passage of Typhoon Lupit in 2009. A hybrid approach is used where a phase averaged model initializes phase-resolved simulations, generating an ensemble of realizations based on observed and simulated directional spectra. Rather than focusing on the probability of freak wave occurrence; the authors examine wave shapes to find out that freak waves with longer lifetimes are associated with narrower spectra and have more pronounced front-to-rear asymmetry and crescent shape deformation of the crest, which are both characteristics of nonlinear wave groups. By comparing freak wave lifetimes from narrow and broad spectra, their study shows that the sea state controls the distribution of lifetimes, whereby the number of nonlinear wave groups increases for a narrower spectrum. The authors conclude that four-wave quasi-resonance and dispersive focusing are responsible for freak wave generation, but their relative significance depends on spectral broadness. An important insight from this paper is that given the importance of nonlinear wave-wave interactions to freak wave generation, current spectral models used in operational wave forecasts using rough approximations to that process are likely unable to properly represent the likelihood of freak wave occurrence reliably. Finally, Osborne et al. (2019) provide account of the application of nonlinear Fourier analysis (NLFA) methods to recorded time series of surface wave data. In the NLFA approach, a wave record is represented by a multidimensional, quasi-periodic Fourier series that allows separating components by increasing levels of nonlinearity, using sine waves, Stokes waves, and phase-locked Stokes waves arising from modulational instability, the so-called “breather packets.” The paper provides a clear demonstration of how the standard Fourier analysis can be “upgraded,” to give useful information on nonlinear features of a wave record. This goal is achieved via a clear description of underlying methods, and an illustrative application to recorded waves from the Currituck Sound data set (Long and Resio 2007). The end result is a manuscript that brings together mathematical approaches for fully nonlinear waves in clear and compelling ways, and challenge the Gaussian approximation often considered in the analysis of wave data. The analysis reveals the presence of a surprisingly large number of breather trains in the Currituck Sound data set, and that only 5% of the energy is carried by small amplitude sine and Stokes wave components, whereas 95% of the NLFA components are found to consist of breather trains. The 15 articles in this topical collection show the continued breadth of the workshop. However, a number of excellent proceeding papers can also be found online at www.waveworkshop.org, where the long history of the workshop has been carefully archived. After a very successful leap across the Atlantic for this workshop, we now look forward to the first visit to the Southern Hemisphere in 2019, and an even more international gathering in the coming years. The conference co-chairs would like to express their gratitude to the organizers and sponsors: Liverpool Institute for Sustainable Coasts and Oceans (LISCO), the UK National Oceanography Centre, the Taylor Engineering Research Institute at the University of North Florida, Environment and Climate Change Canada, and the WMO-IOC Joint Technical Commission for Oceanography and Marine Meteorology (JCOMM). More information about the conference can be found at http://www.waveworkshop.org. ØB gratefully acknowledges funding from the Research Council of Norway through MAROFF grant 256521. We are grateful to Springer (publisher of Ocean Dynamics) for taking the subject into consideration for a topical collection.